Since life was a little cray when we moved and I didn't have time to do a proper goodbye post for my studio, I'm doing a little #ThrowbackThursday today! It was also unfortunately the second apartment I've lived in that the landlord ended up selling the building 😳. NYC real estate is no joke guys.. So today I'm giving it one last hurrah to share some of my final decor dets before it got boxed up! The perk to living in an apartment that is basically just a big rectangle is helloooooo wall space for a BIG gallery wall! Haha, I'm a sucker for a good gallery wall so I filled this baby up. Something I've adopted in multiple apartments now, is my washi tape wall designs! Such an easy way to add some color or dose of excitement to your walls and it's just as easy to peel off when you move. Ideal for renters like me! Another fun touch in the studio was my "confetti wall" above my bar cart. To add a little fun to that wall I got 2 different types of gold paper and used a die cut punch to create the little circles. Pop a little double sticky tape on them and wa-lah confetti wall! I also had the most adorable little balcony that I LOVED! The perk to being on the top floor was there was nothing above me too -- the one perk to living on a 5th floor walk-up! Haha. In true Anna fashion, the balcony was just about as colorful as the apartment! Little colorful studio, you are missed! Especially my extra dose of girliness, or as Chris referred to it as my "barbie dream house" decor. Well, that's a wrap! If you missed the apartment tour of the new digs make sure you check it out here too! Things are about to get a little grout-y with today's DIY post! Get it?! Haha, ok ok maybe it's a little cheesy 😜. As I mentioned in my latest apartment tour blog post, our apartment needed a little TLC when we moved in. When you find an apartment in Manhattan in a great location with a backyard though, you sign that lease and commit to doing some DIY projects.. because #priorities. And let's be honest, when I say DIY projects I'm only referring to myself because while Chris has many great qualities being handy or crafty are not two of them. Of course when you're renting there's a little bit of a limit to the things you can do. 1.) you don't own the place so you can't do anything too crazy and 2.) since you're just renting you don't want to invest too much into any projects. There are just certain things you have to do something about though and our shower definitely fit that bill. Guys.. it was nasty. Living in New York, you're living in buildings that are often pre-war and have a high turnover of renters so renovations are often few and in between because, well, they'll get rented either way. 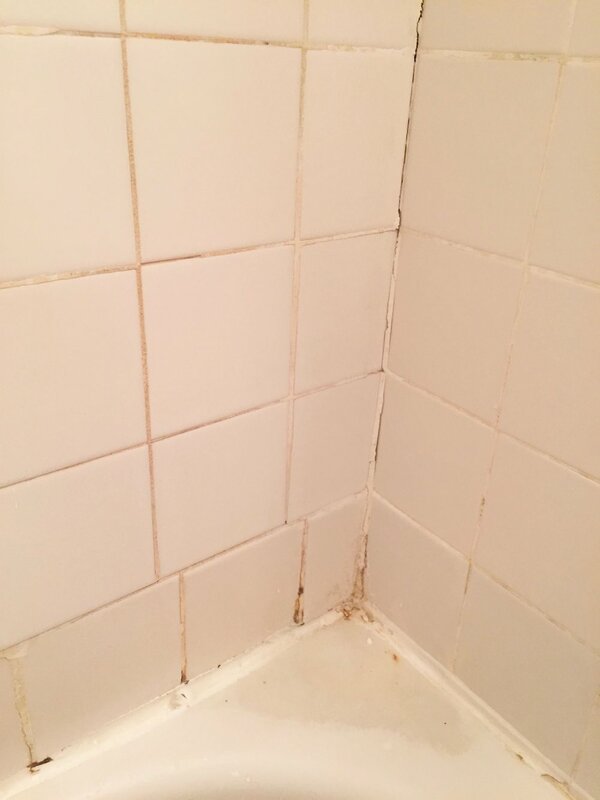 So unfortunately it's not uncommon to end up with a bathroom with moldy caulking or missing grout. Not to fear though! With a few items under $30 and some elbow grease, you too can make some improvements. Yeah... we definitely had to make some improvements there. So here's the dets on what you need to make some magic happen. To get started, first you want to make sure the shower is clean so that you can prep the space. 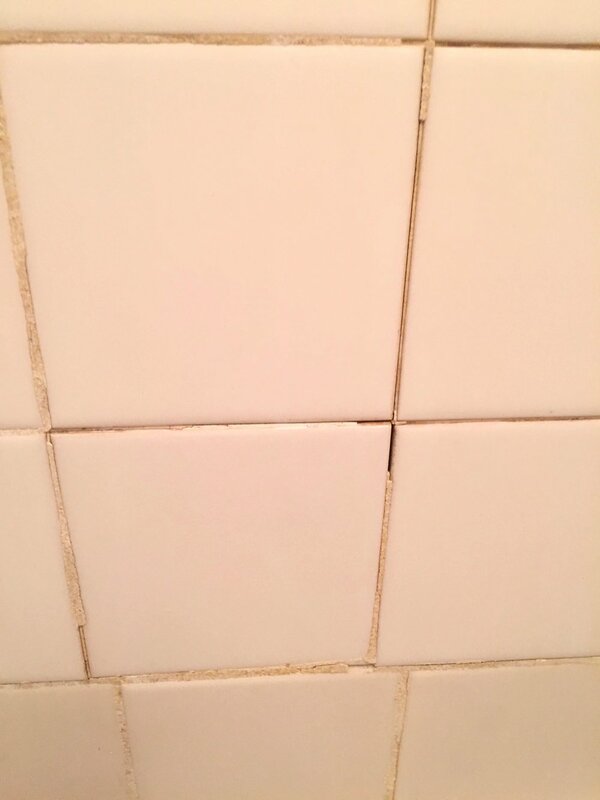 Once it's clean, you'll need to chip away at the old grout to make room for the new and also remove all of the old caulking. I bought this tool and I can honestly say it was the best $5 spent on the project. This little sucker made it super easy to remove everything. Bye bye nastiness! After everything had been removed, I cleaned up a bit and got ready to re-grout! I opted for a pre-mixed grout in a tube from Elmer's -- who knew they also made bathroom products! I had read some great reviews about the product online and it sounded like a less messy option and didn't require as much drying time as some of the others, so I decided to give it a go! It's not as grainy as some other grouts, but it was easy to use and got the job done so those two things were the most important parts to me. Never grouted before? Yeah, I hadn't either, but there are a ton of Youtube videos out there. While DIYing isn't for everyone, and some things are definitely best left to the pros, this one wasn't too bad. Time-consuming but not too difficult. The video below will give you some of the basics. The grout dries pretty quickly and then the next step is to damper your polishing sponge to wipe off the excess. The key to this is giving it enough time to dry, but not to leave it on there for too long otherwise it's a pain in the booty to get off. I found about 20 mins was a good amount of time. After I completed the grout process, I let everything sit for 12 hours per the directions. While the supplies I chose allowed for much shorter waiting times, this is definitely a weekend project. After the grout had sat for 12 hours I moved on to the caulking process. 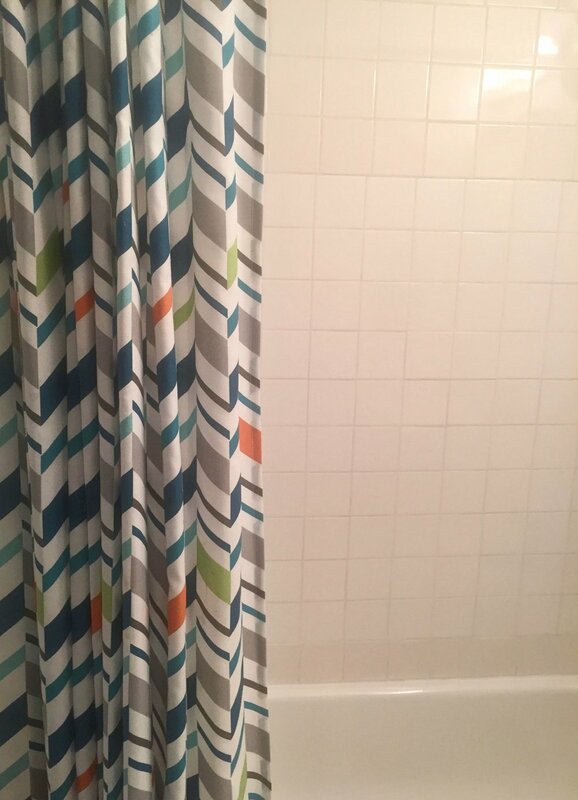 I had used caulking before in past apartments -- clearly I can't handle yucky showers. I will say though, I used a different brand this time and I will never use another again. I highly recommend using this variety from Momentive Performance Materials. Again with the time issue, this brand only requires 3 hours before you can use your shower as opposed to other brands which usually require at least 24 hours. Caulking isn't my favorite thing to do so I definitely wanted to get it right once and not have to do it again because some peeled up because it didn't cure for long enough. This one is also great because you don't need a caulking gun. Just squeeze and go! The tool I used earlier in the project also can be used to smooth our caulking too. After the caulking was complete, it was time to wait! The directions said 3 hours but I decided to let it sit at least 6 before using the shower. I also bought a plastic dropcloth and taped it up on the shower walls for 2 days.. Justttt to be extra careful to protect the work I just did. #OneBathroomProblems If you have another shower, you probably won't need one but I got one just as a precaution. So how did it turn out? I'd say pretty good! It's still not perfect, but oh boy is it an improvement from how it was when we moved in! 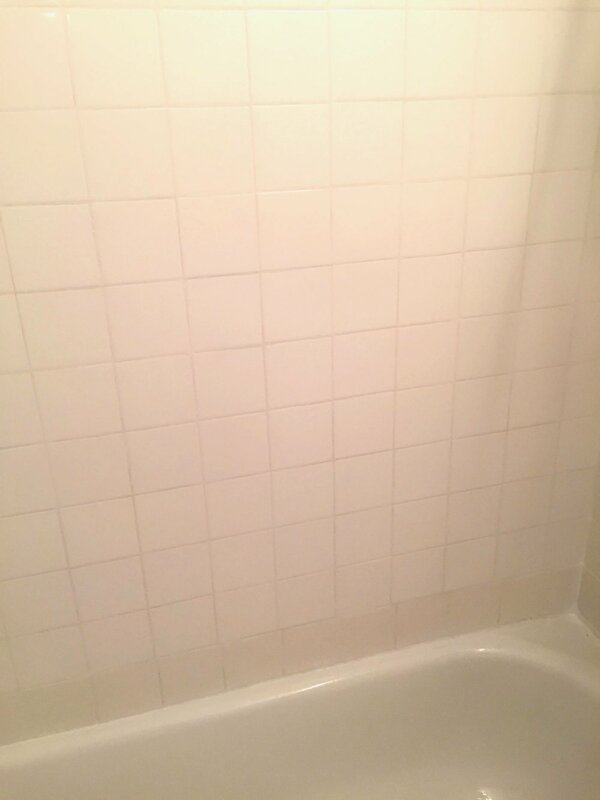 I hope you've enjoyed this post and hopefully I can help out some fellow people dealing with some grout-y showers! If you have any questions feel free to send them my way in the comments.